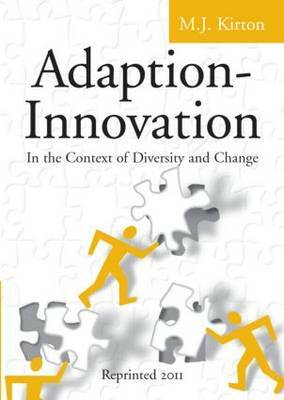 Adaption-Innovation is a timely and comprehensive text written for anyone who wants to know more about dealing with problem solving, thinking style, creativity and team dynamics. In an age when teams have become critical to successful problem solving, Adaption-Innovation (A-I) theory is a model in this field, which aims to increase collaboration and reduce conflict within groups. A-I Theory and associated inventory (KAI) have been extensively researched and are increasingly used to assist teambuilding and personnel management. In the context of the management of diversity and change, Dr Kirton outlines the central concepts of the theory, including the processes of problem solving, decision making and creativity as well as explanatory concepts such as the paradox of structure; coping behaviour; the distinction between how teams collaborate on the common task and how teams manage their own diversity. In addition, Dr Kirton focuses on the positive side of managing a wide diversity within teams that has the potential to lead to the highest levels of problem solving, creativity and effective management of change. The book offers practical information for those helping diverse teams succeed in today's demanding climate. In this fresh context, leadership theory is explored, suggesting a new and interesting approach in use of different styles. For those working with diverse, problem solving teams managing complex change, this is a must have book. It will appeal to a broad range of people, from practitioners such as human resource managers, psychologists, business consultants, and group trainers, to academics studying and doing research in disciplines such as psychology, business, management, sociology, education and politics and the practical use of the hard sciences. *This reprint contains some new insights by Dr. Kirton into the theory. A small number of critical key changes have been made: a new diagram showing the difference between decision making and problem solving; some tightening of some sentences to show that leadership style should be treated as roles; the addition of the Glossary of Terms. Buy Adaption-Innovation by M.J. Kirton from Australia's Online Independent Bookstore, Boomerang Books. Dr. M. J. Kirton is the director and founder of the Occupational Research Centre, with many years' experience in academia and management. He originated the Adaption-Innovation Theory and its measure KAI. He was awarded a DSc by the Council for national Academic Awards in 1991 for his work on Adaption-Innovation.